As a single mom with a day job as an attorney and two girls, 8 ½ (that ½ is important) and 12 years old, with homework and school events, not to mention extra-curricular activities, I have become an expert at juggling. Staying committed to my writing career involves daily reaffirmations. And it would have been much easier to give it up than to try and do it all. But writing feeds my soul—and as a role model for my daughters, I am showing them that when you have a passion for something, you never give up. They are learning about commitment, discipline and perseverance. And mostly, they are learning that you have to believe in yourself. As writers, we have to believe in ourselves or we would never be able to put one word on the page. No one can write exactly like you, because no one else is you. So when you have those moments of doubt as a writer, remind yourself that you are one of a kind. And your stories are unique. 1. Write what you love. You are spending precious moments on writing. Moments away from your kids or other activities. Sometimes even losing sleep. Writing with kids involves a tremendous amount of sacrifice. So it needs to make you happy. Don’t be afraid to start something new if a story isn’t working for you. Feed your soul. 2. Don’t be afraid to use a pen. A pen is a writer’s BFF. You can scribble while you wait for your daughter at soccer practice or your son at his piano lesson, in the pick-up line at school or even while you are watching that Disney Channel show for the 11th time. I keep a pen and paper next to my bed so I can write down dialogue when I wake up or just before I go to sleep. Even a crayon works. 3. Engage your kids. Make your kids a part of your writing. My girls are the first people to hear new story ideas and read pages of my WIPs. They give me honest feedback and, since they are my target audience, it really enhances my work. Reading pages out loud to an audience really helps determine what works and what doesn’t. Let your kids help you. Find fun ways to engage them in your work—making up character names or drawing your settings. 4. Network. Making writer friends helps you feel like you are part of a community. Writing is such an isolated career, but reaching out and making friends connects you to the profession. And sharing struggles with other writers is much more comforting than trying to explain them to a non-writer. A non-writer can empathize, but a fellow writer understands. SCBWI has been wonderful for me. There are also local groups and blogging communities. You can reach out with social media to connect to others. Just make a connection. 5. Write every day. Even one word. It will add to the last word and the next word. And eventually, you will have a sentence. The hardest thing for writers with kids is being able to write daily. And when you don’t write daily, you lost momentum. Other things get in the way, other super important things. It’s really easy to lose track of days and weeks when kids are so busy, and we are busy raising them. Even blogging counts. Just work your skills daily. 6. Don’t compare yourself. Okay, I’m not very good at this one. But I am putting it on the list in the hope that I will improve. I don’t need to say much about this except that everyone’s path is different (you know this already, as I do), and we just have to stay true to ourselves and move forward. We never know what is next. So try not to look at other people’s success and let it discourage you. Comparison is a sure path to writer’s block. I can guarantee it. So keep your eyes on your own work, learn from others and move forward. 7. My secret weapon. Deadlines are my secret weapon. I make them up for myself by setting goal dates for completing a new manuscript. And then I hold myself to them by telling others—my agent or my friends. It is my way of making sure I complete my manuscripts. I guess it works for me because I love school. I like deadlines. Before I had an agent, I would submit writing to contests. And the contest deadlines helped me to finish the work. Or I would attend a writer’s conference and commit to completing the work before the conference so I could pitch it to an agent or editor. Even just marking a date on the calendar helps. Today, I am thrilled to feature Holly Thompson to talk about her new release, The Language Inside (Delacorte Books for Young Readers). Debby: Welcome, Holly. Thank you for visiting my site today. And many congratulations on your new YA fiction release, The Language Inside. Your YA verse novel, Orchards, won numerous awards and critical praise. Was there a temptation to write a follow up novel in verse? Holly: Thank you for having me! Like Orchards, The Language Inside began as a verse novel, not because I wanted the follow-up novel to be in verse format but because the story started telling itself to me in verse—probably because of Emma’s voice and the pain of displacement, the aphasia she experiences during her migraines, and the poems created as she volunteers to help Zena at the long-term care center. There is a lot packed into this novel and verse enabled the various elements to be pared down and braided together. I write in prose as well as verse, but these novels definitely required verse. Debby: What was the inspiration for The Language Inside? Holly: As a graduate student in the NYU Creative Writing Program, I volunteered to assist patients writing poetry at Goldwater Hospital and participated in the writing workshops led by poet Sharon Olds there. At Goldwater I was assigned to several patients, and my experiences with poet Julia Tavalaro (see my blog post) were unforgettable and inspired the character of Zena in The Language Inside. I wanted to write about a teen character working with such an individual, who, despite the inability to speak, can control and manipulate conversations and communicate a profound determination and zest for life. Debby: What is your favorite line in The Language Inside? Debby: Holly, that is breathtakingly beautiful. Thank you for sharing Emma’s poem. In addition to the undeniable power of your prose, I think you do a wonderful job of depicting the difficulties of being bicultural. I know you have lived in Japan for many years. What would you miss the most if you returned to the US? And what do you miss the most about the US while living in Japan? Holly: Whenever I’m in the U.S. I miss Japan—big things like the volcanic landscape, many aspects of the culture, baths, the service ethic, as well as specifics like the cicada songs, train convenience, my neighborhood, Japanese cuisine. It’s hard to pinpoint any one thing, though I always miss Japanese food when I’m not in Japan. And when I’m in Japan, I miss my U.S. family, New England landscapes, diverse U.S. cities, casual conversations, pies and burritos. Debby: Orchards is such a beautiful, heart-wrenching book, and every time I look at the pages again, I am struck by how you have managed to tell such a complex story with poetry. Did writing the story in verse limit you or did it expand you ability to tell the story? Holly: Orchards was a painful story to write, and it was only possible in spare, pared down verse in which the white space provides breathing room for the character Kana, as well as the reader. The verse and the voice are so integral to the story that I didn’t find the format limiting; rather, the story fed the verse and the verse fed the story. Debby: Do you have a favorite line in Orchards? Debby: I think these feelings can be shared by all of us when people expect us to be one thing and we are more than that. We are all hot and cold both flowing as one. You have this incredible ability to grip the reader with Kana’s pain and then give us some space to recover. The hanging crow image in Orchards was so powerful for me. And the pain in the book really comes through viscerally in those pages. My book was also seeped in grief, and the writing was very painful for me. How do you work through the pain of your characters? Holly: Yes, the hanging crow, a fairly common rural Japan custom, made for an intense scene. Grief is central to Orchards, and I cried my way through writing the story. I had to force myself to write through to the end of my first draft during a period when my husband and children were away—crying as much and as long as I needed to. Of course, as I was writing through the pain and Kana’s ranging forms of grief, I was also discovering Kana’s humor, compassion and resilience. Debby: I’m always interested to hear about how other writer’s work. Can you tell us a little bit about your writing process? Do you work with a critique group? Holly: I’m always working on writing, but not at the same time each day and not necessarily every day. I work with a critique group—writer members of SCBWI Japan, both face to face and online. I share the opening chapter or two of a novel once I feel like I know what I’m doing and where I’m going. The critique group comments are so helpful in grounding me. Later, after several revisions of the full draft, I usually share the manuscript with a few beta readers. I also enlist the help of folks who helped guide my research and have them check pages within their area of specialty. And of course, feedback from my agent and editor is always critical in shaping my novels. Debby: What do you hope your readers will take with them after reading The Language Inside? Holly: I hope that readers will feel as though they’ve journeyed to Japan in a way, and that they’ll want to know more about Cambodia and Japan, and vibrant immigrant communities such as those found in cities like Lowell, Massachusetts. Also, like Emma, many people around the world identify with cultures outside their ethnicity and heritage, so I hope that readers will become curious about the cultures and languages that individuals may carry within themselves. And finally, the characters of Emma and Samnang both volunteer on a regular basis—perhaps they will inspire readers to consider what they can do to make a difference in their communities. Debby: I hope so, too. Thank you again, Holly, for taking the time to be here today. And thank you for writing such beautiful fiction. You can find out more about Holly at her website www.hatbooks.com. Today, I am sharing my conversation with Cynthia Leitich Smith. Cynthia is the author of the YA TANTALIZE series, the FERAL NIGHTS series, several YA short stories and books for younger kids as well as the popular Cynsations blog. Debby: Cynthia, thank you so much for spending some time with me today. I wanted to ask you about writer’s platforms. My agent talks about the importance of a writer building his or her platform with blogging, Facebook, Twitter, Pinterest, Tumblr. I reached out to you because your platform is so well-established, and you have given me wonderful advice. Can you share some of the ways an author can build a platform? Cynthia: Authors should begin by setting up home base on an official website. This will be the foundation and launching point for everything that follows. It should look professional and remain up to date with regard to new releases. Then check out what’s available in terms of social networks and think about your goals and what appeals to you. You don’t have to be everywhere, do everything. You probably don’t have that much time, and you’ll burn out if you try. Do what you do well rather than going scatter-shot all over the Web. A blog is like a puppy. It’s always hungry. If you blog, think about your reasons why, your content focus, and most importantly, your blogging schedule. At the risk of sounding vaguely gastrointestinal, it’s better to be regular than frequent. Most other options are a lower commitment, and keep in mind you can always guest blog for someone else (and probably should do that on occasion regardless). As for the social networks, teens may be migrating from Facebook, but at this point they have too much real estate on the site to abandon it completely. It also hosts a terrific community of dedicated children’s-YA book professionals, making it a preferred spot for industry networking. Twitter is a blessing to the attention-challenged. It’s the ultimate short form, and more young adults appreciate the lower-drama vibe. It’s also a natural for pointing followers to your site or blog. Consequently, Facebook and Twitter are my top recommendations. But if you enjoy visual learning, try Pinterest. Or whatever speaks to you. Not every expedition will be a long-term success. I had a significant fan following on MySpace, back when teens were on MySpace, but it’s fallen by the wayside. Google+ seems to be struggling to get a foothold, but the Hangout video feature offers wonderful opportunities for online author events. It’s okay to pivot. If you abandon a blog or network, just make sure it’s clear you’re gone and let folks know where to find you from there. Debby: The hardest part for me is thinking of things to say-do you recommend that an author have a strategy or theme to their posts? Cynthia: Start with Author You. Who is your audience? What kind of books call to you? What topics? What are you passionate about? If you are a YA fantasy novelist, write about the craft of creating that kind of book. Invite fellow authors in that arena to chime in with their thoughts. Highlight those books that you love. Post photos of dragons. If you’re a nonfiction writer, highlight articles and breaking news related to your topics. Interview experts in those respective fields and authors coming to those subjects from another angle. Include photographs of your research trips. Do you write about bees? Give away a jar of honey! If you’re a Writer Mom, offer tips to parents who’re likewise trying to balance childcare and the creative life. Share the occasional book tie-in activity or recipe or décor coup or article on gender and toys. Mitali Perkins is passionate about India settings, multicultural children’s-YA literature, and social justice related awareness-raising as it impacts young readers. You can glean all of that from visiting her site, Tweet deck, etc. My husband, Greg Leitich Smith, writes adventure stories-most recently on about three young Texas teens that travel back to the Cretaceous to rescue their sister and solve a family mystery. He has an ongoing feature wherein children’s-YA book pros send him photos of themselves with images of dinosaurs – museum displays, stuffed toys, Sinclair signs, whatever. He did a Dino-A-Day T-shirt celebration, modeling dinosaur T-shirts at various Austin settings. Libba Bray’s blog, like everything she does, is a tour de force. An exercise in her awesomeness. You can do that — just rock on with Amazing You and share it, so long as you have the confidence. You could also combine forces with a team blog or promotional group. Just keep in mind that the branding often goes to the team at the expense of all of the individual contributors. Debby: How do you balance the time you spend writing with building of your relationships? Cynthia: Setting aside travel/event days, on average I’m on the computer at 8 a.m. as Author Cyn. Then I work out for an hour or two between 10 a.m. and noon, and then Writer Cyn takes over for the afternoon. The two Cyns vie for dominance in the evening. The winner is typically contingent on what’s going on in terms of my global workflow. Debby: Writing is such an isolated career, yet we are expected to have connections. I have found other writers, even really successful ones to be extremely accessible and helpful. I have also made many writer friends through SCBWI, can you share some of the ways an author can network? Cynthia: First, I’d say that community is crucial. Words on the page are most important. But community can keep you going in both great and challenging times. You mentioned SCBWI, and it’s wonderful. There may also be additional writing organizations in your area. Here in Austin, I’m likewise active in The Writers’ League of Texas. I strongly recommend attending local book events, including launch parties. Support your colleagues and learn from them how to do marketing and public speaking. You can take the incentive to organize a private workshop or get together. I’ve made some of the best friends of my life by simply inviting them to (bring food and) write around my dining room table. Or simply say “howdy” on Facebook (or wherever) and strike up a conversation there. Debby: One thing I have to ask you about social media and building a following-should one pay attention to their numbers-and what do they really mean? Cynthia: Pay attention but don’t obsess. If you’re losing followers in droves, you might want to take a look at your recent content and ask why. If you’re not building steadily, you may want to amp things up a bit. But don’t make yourself crazy. Networking is a long-haul proposition. Building quality relationships, offering solid takeaway to friends, followers and visitors is the priority. Debby: I also wondered about changing your photo tag. I see some people changing their photo often, and others never change them. Do you have an opinion about this? Cynthia: Ideally for branding, it should be consistent and standardized. But that’s a bit stagnant. Go for something appropriate, so long as it’s a recognizable photo of you (not your cat, not you and someone else, not your latest book cover-the latter being a bit too on the nose these days). Debby: If you had to give authors one piece of advice about building their platform, what would it be? Cynthia: People buy what you sell them. Think about how you want to be viewed. What you want to say. How you can lift up your audience. In the end, that’s what it’s all about–not just work but life–having the courage to share the best of yourself and doing it in such a way that it empowers others. Debby: Cynthia, your words are encouraging and hopeful, and you have broken down the building of the writer’s platform into understandable tasks. Thank you for sharing your experience and your talent with us today! For more information about Cynthia, visit her website http://www.cynthialeitichsmith.com, Twitter @CynLeitichSmith or her blog, Cynsations http://cynthialeitichsmith.blogspot.com. 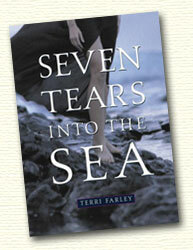 Debby: Today, I am honored to host Terri Farley, author of the PHANTOM STALLION series and SEVEN TEARS INTO THE SEA. Thank you for being here today to talk about giving back. I know you speak and write of Authoring Change. As I understand it, you use this term to describe how you are creating change through your writing and actions. How did you come up with this term–and can you explain more about it? Terri: A few years ago, one of my young readers — Christy from Texas — emailed me that national legislation had just slashed the protection of America’s wild horses. I told her it was probably just an Internet rumor, but I was wrong. Mustang slaughter, hidden in an appropriations bill, was voted in. Within the hour it took me to discover Christy was right, I’d received an avalanche of emails from Phantom Stallion readers asking what I was going to do about it. Those readers had a lot more faith in my ability to “do something” than I in fact had, but, together, we launched a Hearts for Horses campaign, and I ended up taking over 1,000 heavily illustrated Valentine’s Day letters to Senate Majority Leader Harry Reid. Debby: Your readers have faith in you because they know you care and not only that, but they know you will take action. You have worked so hard to save mustangs from slaughter. Can you tell us more about the plight of the wild mustang? Terri: Wild horses are being killed every day, and we (American taxpayers) are footing the multimillion dollar bill for it. Since 1971, when mustangs were declared endangered, the Bureau of Land Management was appointed to protect them. Since then, BLM has rounded up over 270,000 wild horses with helicopters. Many die. Many miscarry their babies or have them run to death. Most of the others are separated from their families and confined in pens for the rest of their lives. I’ve been there. I’ve seen it. I’ve tried to stop it with a lawsuit. Kids are known for saying “That’s not fair!” to decisions they don’t like, but in this case they’re right. Many children live with parents who don’t take good care of them and they identify with the horses in ways that are touching and sad. Debby: I know of a local program that allows kids from difficult home environments to work with abandoned dogs. It gives them a great sense of accomplishment and in some cases, more love with these dogs than they have ever known in their homes. Can people own wild mustangs? And what is the difference between purchase and adoption of a mustang? Terri: People can and do own mustangs. I own two and a half. I failed to stop the round-up of the Calico Mountain mustangs, the bands which inspired the wild horses in my books. So, I decided the least I could do was rescue two of them myself. I adopted Sage (named by a reader) and bought Ghost Dancer. The two mares were captured in the same place on the same day, but Sage was only 2 years old, so she was “adoptable.” That meant I had a year to prove I would take good care of her before I gained title to her. Ghost Dancer was vulnerable under a law that says mustangs can be sold for any purpose, even meat, if they’re 10+ years old. Most vets say an equine ten-year-old is equal to a human 35-year-old. Not exactly ancient. In addition, horses of any age can be “sold without limitation” if they have been offered for adoption three times and failed to find a family. My half horse is the real Phantom stallion. I share him with a wild horse advocacy group. They notified me that because he was on state, not federal land, he was considered “stray livestock.” He was on his way to a slaughter auction when we were able to raise the money to save him and move him to a 5,000 acre sanctuary. Debby: I remember reading about the round ups the first time many years ago–the loss of the wild mustang is tragic and permanent. What can people like me do to help? It’s the quickest way to learn what’s happening now. Next, talk about it! The women at the gym, in my critique group, the plumber, my friends and relatives ask me for updates. Once they know they’re financing this cruel disaster, they care. Then, check out http://wildhorsepreservation.org/. It is the organization I trust to give me the facts and tell me how to take quick action online. The Internet makes it possible and easy to stand up for what you believe. This month, 30,000 people told the new Secretary of the Interior they want her to stop the runaway round ups and listen to the National Academy of Sciences. Watch for my Tweets or be my Facebook friend. I share lots of wild horse news. Debby: Terri, the NBC clip is heartbreaking. Thank you for sharing these links so people can learn more. What do you think people will discover about themselves when they take steps to cause change? Terri: You know that saying “Speak up for what you believe, even if your voice shakes”? That totally applies to me. I’m more comfortable writing than I am lobbying senators and testifying in Federal court, but my readers count on me and I’ve discovered I can do it. Kids who read have a knack for writing. They know the power of words, but they need someone to listen. One of the coolest things ever was when I took reader letters into a BLM board meeting that was streaming live online. When it was time for public comment, I asked if I could read a few letters for the record. I was told I couldn’t even read one. I knew my readers were watching, so I did it anyway. I got about six in before they cut off my mic and the kids loved it. They discovered they could stand up for wild horses, and I would stand up for them—they got a standing ovation from those attending the meeting. The board could not overlook that. Debby: What an inspiring story—and how wonderful to share your readers’ letters. What would you tell other authors who want to reach out and make a difference though their work? Terri: Do it. Don’t preach, of course, but write from your head and heart and people will join you. HarperCollins sent out over 200 press releases about my work to help wild horses. Marine Mammal Rescue used autographed copies of SEVEN TEARS INTO THE SEA as a fund-raiser, even though it’s a fantasy. Other humane and literacy organizations have done the same. It’s good for your career as well as your legacy as a caring human being. We are one book away from changing the world; it might as well be yours. Debby: I am printing your last sentence out and hanging it on the wall above my computer so I can see it every day! Thank you so much, Terri, for inspiring me today. For more information about Terri’s books and Authoring Change, visit www.terrifarley.com.